Most drivers don’t consider themselves to be “speeders” so they often don’t see the benefits of radar detectors. In today’s world, police have all kinds of tools at their disposal, many which are constantly evolving. 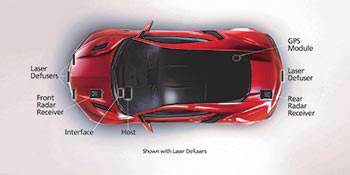 The fact is, though, radar and laser detectors have never been more relevant – or more advance. 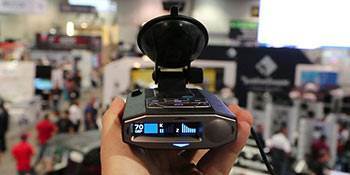 There is one very important fact that you should understand; radar and laser detectors are completely legal everywhere in the United States except Virginia and Washington D.C. The reality is that more people are driving and traveling the roads than ever before. Roads now have speed limits that are changing at various points, often without the drivers knowledge, drastically increasing the chances of getting caught in a speed trap. You invest in your car and insurance to protect yourself from accidents and carelessness of others. Why wouldn’t you invest in protecting yourself from speeding fines as well? There are roughly 41 million drivers ticketed for speeding per year, and the average ticket costs $150 dollars. That is more than $6 BILLION a year collected from just speeding fines. 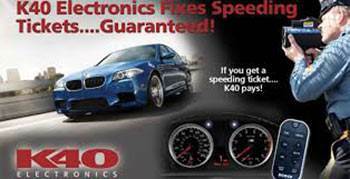 Let the experts at Jackie Cooper Tint & Electronics help protect you and your hard-earned money from constantly increasing speeding tickets! Drive Ticket Free Guarantee from K40! Get a ticket during the first year of ownership, K40 will pay for it, subject to the terms and conditions below. Simply send us a copy of the radar or laser speeding ticket, your proof of payment of the ticket, and your receipt for your K40 purchase. K40 started offering this guarantee in 1985 and we still stand by it today!